Practice Casting, Forming & Welding questions and answers for interviews, campus placements, online tests, aptitude tests, quizzes and competitive exams. This set of Casting, Forming and Welding Multiple Choice Questions & Answers (MCQs) focuses on “Gases in Metals”. 1. Which of the following metals comes in an exothermic group of metals when the solubility of hydrogen is concerned? Explanation: When the solubility of hydrogen is concerned, titanium comes in an exothermic group of metals which absorb more hydrogen than endothermic metals (iron, magnesium, nickel etc). Further, in exothermic metals, the solubility of hydrogen decreases with temperature. The reverse is true for endothermic metals. 2. Which of the following equations represent the solubility (S) of the hydrogen in the metals? Explanation: Solubility (S) of the hydrogen in the metals is expressed as S = C exp[-Es/(kθ)], where Es (positive for endothermic) is the heat of the solution of 1 mol of hydrogen and θ is the absolute temperature with C and k as constants. Equation of solubility clearly shows that gas precipitation during cooling cannot take place in exothermic metals for which Es is negative. 3. Presence of hydrogen in endothermic metals causes lattice distortion. 4. Which of the following formulas show the Sievert’s law of percent of hydrogen (H) present in a melt? Explanation: Sievert’s law states that the amount of hydrogen dissolved in a melt varies as % hydrogen present (H) = K√pHa, where pHa is the partial pressure of hydrogen in the atmosphere over the melt, and K is a constant. 5. Maintaining of hydrogen level to a minimum in a melt is very important because there is no simple dehydrogenating technique. Explanation: There is no simple dehydrogenating addition to eliminating hydrogen in the form of slag. So, care should be taken to maintain the hydrogen level to a minimum. The method used for removal of hydrogen in which partial pressure of hydrogen is reduced by bubbling some other dry insoluble gas through the melt; this method is not easy and also causes many other problems. 6. Which of the following methods is best for preventing the solutions of gases in metals? Explanation: Vacuum melting is increasingly being used for preventing the solutions of gases in metals and the combinations of reactive elements in the melt. Additions in the ladle, rather than in the melt, have been found to be more effective for controlling the gases and chemical compositions. 7. Improper venting arrangement causes mechanical trapping of gases in metal castings. Explanation: The gases in metals lead to faulty castings. In metal castings, the gases may be trapped mechanically by having improper venting arrangements, in such situations trapping of gases can be prevented by making proper venting arrangements in the mould. Explanation: For ferrous and nickel based alloys, nitrogen cannot be used because it is soluble in these and also it may form nitrides which affect the grain size; therefore, in ferrous alloys in particular, accurate control of the nitrogen is necessary. In such situations, carbon monoxide bubbles are used. 9. In the hydrogen removal process, carbon monoxide for ferrous alloys removes not only hydrogen but also nitrogen. Explanation: Carbon monoxide for ferrous alloys removes not only hydrogen but also nitrogen. So, for ferrous metals, a marked decrease in the solubility of nitrogen during the phase change may give rise to porosity in the castings. And the re-entry of nitrogen from the air is also prevented by the impermeable slag at the top of the melt. 10. Which of the following metals has the lowest liquid solubility (cc/kg) of hydrogen at atmospheric pressure? Explanation: Hydrogen solubility is an acute problem in ferrous casting. Liquid solubility of hydrogen in aluminium is 7cc/kg, which is lowest comparatively to other metals. So, it is not very difficult to handle aluminium and chances of inclusion of gas are also very less due to less liquid solubility. 11. Variation in solubility of gases can cause the generation of gases in metal castings. Explanation: At different temperatures and phases, the gases may be generated due to the variation in their solubility. And chemical reactions also lead to a generation of gases in metal castings. The gases most generally present are hydrogen and nitrogen, in which removal of hydrogen from the melt is very necessary for better castings. 12. Which of the following gases can be beneficial in imparting certain desirable qualities to the castings? Explanation: Nitrogen can be added in castings to impart desirable qualities. For example, when this gas is added to steels, it improves strength, fatigue life, corrosion resistance and many other properties. Nitrogen would affect these properties only if it remains very fine nitrides in solid solutions. Sanfoundry Global Education & Learning Series – Casting, Forming and Welding. 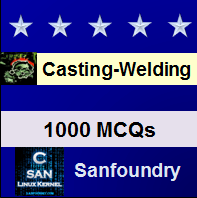 To practice all areas of Casting, Forming and Welding, here is complete set of 1000+ Multiple Choice Questions and Answers.